Although for many years we have traveled in the Canadian Arctic, this was our first visit to the Baffin Region and our first experience traveling by dog team other than our own. In mid-May 1994, we flew to Pond Inlet from Iqaluit in a two-prop Hawker Siddley 748 configured for half seats and half freight. The flight attendant wore a jumpsuit and combat boots! Every time we stopped (twice before reaching Pond), when the crew opened up both the cargo door in the front and the passenger door in the tail, the snow blew through like crazy. We were supposed to spend three days going by dog team to an outpost camp and two days by snow machine to the floe edge, but dogs were dying at the outpost camp and no one knew why, so our plans changed (not uncommon in the Arctic) to spending five days traveling by dog team to the floe edge, a fortuitous change indeed as this ultimately turned out to be a defining moment in our future. Mark and I and an advertising executive from New York were to travel on two qamutiit, Jayko's fourteen dog hitch and Paneulie's thirteen dog team. The qamutiit were about eighteen feet long. Jayko's was "high-tech", with aluminum runners. He paid $1,500 Can for those two pieces. Paneulie's runners were made of wood. Wooden cross ties were common to both as were the polypropylene “shoes” screwed to the bottom of the runners. This plastic was very thick and pieces of it were carved into the fittings used to fix the bridle to the sled, the tug lines to the bridle and the harnesses to the tug lines, all quick disconnects with no mechanical parts. Each naked qamutiq was first covered with a layer of plywood (salvaged from some of the many packing crates that arrive yearly by ship, In what is called sealift, when the hamlets are provisioned). Next, a huge plastic tarp was centered over the sled. Tents, foam pads and gear were strategically positioned on board. The tarp was folded over the supplies then winter harvested caribou hides layered on top. At the back of the qamutiq was a sturdy wooden box, about two feet by three feet by three feet which held our provisions and cooking gear. We packed food for humans only. We would have to hunt for dog food during the trip. Our personal stuff, sleeping bags and back packs were piled behind the boxes, and the whole load was lashed down with line of polypropylene or seal. Sometimes, the distribution of the gear varied slightly, but basically while running, the only things not secured down were the passengers, camera gear, the whip and the rifle. Some of the Inuit Dogs appeared phenotypically pure, some not. None were crossed with wolf. They ranged from fifty to eighty very lean pounds. Most were very friendly, especially the younger ones. A few were painfully shy and couldn't accept any kindness we tried to offer them. None of them were considered pets, but their owners were very proud of them all. The dogs were fed seal every other day. They were never watered, their bodies receiving most of the essential fluids from the chemical breakdown of a very high fat diet. If they got thirsty, they ate snow. The dogs run in a fan hitch because they need to have the freedom to pick their way around the sea ice jumbles, and when a dog refuses to jump a lead of open water and falls in, the whole team doesn't fall in. Harnesses were made of two-inch wide strips of bearded seal skin, almost identical in design to the simple recreational harness we use except there were separate strips running between the front legs, joined at the breastbone by a very short lace made of seal. Some of the harnesses were decorated with a fringe of colorful yarn. Tug lines were also made of seal. Between eighteen and twenty feet long, they are of one continuous piece of material. Only the very large bearded seals are used for this line. The long strips are prepared by cutting in tight spirals around the carcass, then pounding and stretching the hide. Loops are hand sewn with sinew taken from the backs of caribou. A big steel needle is forced through the thick hide with a thimble (or rather, thumble) made of really thick, tough walrus hide. It was unusually warm when we started out, about 15-20°F, but both humans and dogs were eager to get underway. The intense sun combined with light winds made the air so warm that we needed neither winter wolf mitts nor glove liners. We often unzipped our parkas. Overheating in the Arctic can be deadly - sweat is the enemy. We had plenty of time to enjoy the scenery as we glided out onto Pond Inlet (the body of water). Bylot Island was to the north, our left. It is sharply mountainous and has three receding glaciers gently sloping to the shore. 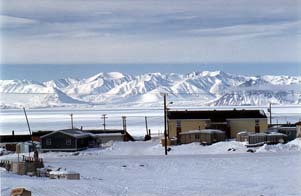 Before long, the mountains of Baffin Island to our right cut the hamlet from view. The sky sparkled in between the peaks. The arctic can be a profoundly silent place when the wind isn't blowing and nothing moves. For me, this intensified all the sounds that are made and on this our first day out I marveled at the cadence of the trotting dogs, their freight train like panting, the swish of the runners and the softly spoken Inuktitut commands given to the dogs by their drivers. For the most part, the inlet ice was very smooth but not flat. Gentle, motionless waves, frozen in place as the water undulated during freeze up, gave some character to the surface. Even savage winds could not force the snow to level them out. In some areas, this wind had hard packed the surface, making the dogs' work easy. But in others, the temperature softened snow made the going difficult for most of the trip. When used to perk up the team or to urge on a dog who seemed to be slacking off, the twenty foot wooden handled sealskin whip cracked like thunder. The drivers were deadly accurate, usually sending it snapping to either side of the team or over the ducking heads of the dogs and occasionally right on target on a dog not maintaining the expected pace. Being our first experience of this sort, it was difficult to reconcile the toughness of the dogs with the pitiful sound they made when the whip found its mark. It may be hard for some to understand or accept how the dogs were handled. It is not as if their owners didn't love and treat their dogs well, because they did. Jayko and Panuelie were experts and knew what was necessary to get the dogs to do what they must. Our lives depended on it. There were no food or fuel depots along the way. 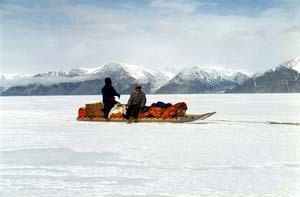 Although we had a Spilsbury (two-way radio) along, if we ran into serious trouble, help by air or snowmachine would not necessarily be quick to arrive as the weather could turn ugly in a few minutes, with only the dogs and the skills of our Inuit guides to find the way, find the seals and stay clear of bears. We traveled for hours without stopping except for a couple of five-minute interludes to unbraid the tug lines that the dogs weaved as they varied positions. Occasionally, a dog not performing well had his tugline shortened. This was done literally on the run. The driver would jump off the qamutiq and run along, grab the line, haul back the dog and shorten the line with a quick knot, then hop back on the qamutiq, sitting or lying propped up on one elbow at the front of the sled, not even be breathing hard! Mark and I would take turns between sitting upright on the tack box or sitting leaning up against the front of the box. At a five to eight miles per hour pace, we had plenty of time to contemplate the view, our distance from home, how what we were doing at the moment was better that we could have possibly hoped for, how our safety rested in the hands of our Inuit guides and their dogs. In this we were feeling very secure. After what seemed like eternity, we stopped for a lunch break of cheese, sliced processed meats, peanut butter, white bread, bannock (the staple baking soda bread of the arctic), tea and soups. While we took our pause, the dogs rested although they didn't look the least bit weary. Some rolled around on their backs trying to cool off. Others got up, wandered over to nuzzle another dog, then flopped down again. None gazed at our food. 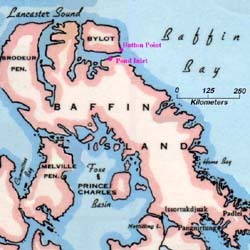 Button Point is a little blip of land jutting out from the east coast of Bylot Island into the Baffin Sea about forty miles east, north-east of Pond Inlet (the hamlet) at the mouth of Pond Inlet (the body of water). It was more than eight but less than twelve by the time we reached camp. Although there was a small wooden building on a bluff high above the shore, we set up camp right on the ice covered beach. Getting the dogs picketed came first. The chain was hauled out of its storage container, a former plastic gasoline can with part of the top cut away. 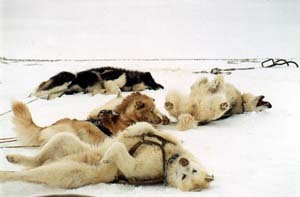 We were allowed to unhitch the dogs to roam loose around the camp site as the snowhook ends were pounded into the ice. The chain was stretched out revealing paired drops onto which the dogs were randomly assigned. The qamutiit were unloaded and the double-wall, cabin-style canvas tents erected. Instead of tent stakes, pairs of holes connected by a small but strong bridge of ice - davits - were chopped into the ice with a knife and the ropes were looped around. A plastic tarp was put on the ground inside the tent, then foam pads, followed by hides and then sleeping bags. All the gear was sorted through and put in its place - food, firearms and camera gear outside, Primus stove and duffel bags inside. Once organized, it was time to do the supper thing. Jayko and Panuelie were unquestionably expert mushers and capable of taking care of themselves out on the land. But this was their first time guiding tourists. So our outfitter back in Pond Inlet took it upon himself to prepare an elaborate meal plan. We all gathered in Jayko's tent and the menu was removed from its carefully stored location in Jayko's pocket. He studied it with great solemnity as we waited eagerly for news of the forthcoming culinary treat. He passed the paper around. We looked at each other with incredulity. Who did our outfitter think he was dealing with - a bunch of pansies? We laughed and giggled like rowdy school children at this precise and complicated menu, then collectively decided that caribou stew would be the first supper no matter what was written down. The formality between we southerners and our Inuit guides began to melt away like the ice heating up in the tea pot. We ate, we traded stories, shared chores and sometime much later, with the sky bright as ever, we peeled off a few layers of clothing and crawled into our sleeping bags - Panuelie, Mark and me in one tent, Jayko and Dave in the other. The dogs had long since settled down. It was not their day to be fed. Besides, there was nothing to feed them. Tomorrow they would take us the twelve miles out to the floe edge and along the way we would hunt for seals.